Technology is shaping and reshaping K-12 teaching and learning across grade levels and subject areas. The emergence of Information Communications Technologies have changed the nature of literacy including what it means to read and write. Despite these transformations, schools have been slow to integrate technology in meaningful ways. New curricula like the Common Core have attempted to bridge the gap between teaching and learning and the use of technology; however, teacher professional development has yet to catch up with these changes. The focus of this chapter is on two models of teacher professional development used to engage and prepare inservice teachers for using digital technologies and Web 2.0 tools in their writing instruction. The authors explore the challenges and benefits of both models and discuss what they have learned about teacher professional development around technology and writing. They argue that while neither model is a “best way” of approaching teacher professional development, elements of both are beneficial in meeting the needs of teachers. Technology is shaping and reshaping K-12 teaching and learning across grade levels and subject areas. The emergence of Information Communications Technologies has changed the nature of literacy (The New London Group, 1996; Leu, 2002; Luke & Elkins, 1998) and what it means to be literate including to read and to write. New terms have been coined to capture this dynamic, including Multiliteracies (The New London Group, 1996). The impact of these changes has been profound and has caused educators and teacher educators to rethink modes of literacy instruction (Taylor & Yearta, 2013; Leu, 2002). Despite the advancement of technology recently, schools have been slow to respond (Cuban, 2001). K-12 schools have resisted adopting new technologies (Cuban, 1986; Collins & Halverson, 2009) and new teaching methods (Evans, 1996; Tyack & Cuban, 1995). The reasons for this resistance are varied and often justifiable and we discuss next. However, there is evidence that teachers are integrating technology into lessons even if the practice is not pervasive. Teachers in the early grades (Barone & Wrights, 2008; Labbo, 2005; Zawilinski, 2009; Zucker, & Invernizzi, 2008), middle grades (Oakley & Jay, 2008), and secondary levels (Huffaker, 2005; Krucli, 2004; Wolfson, 2008) have developed numerous applications of technology for teaching and learning. These span the gamut from more traditional Web 1.0 applications (Krucli, 2004) to Web 2.0 applications such as blogging (Zawlinski, 2009). Teacher resistance has been cited as an obstacle to more fully integrating technology into teaching and learning in classrooms. Hammond, Reynolds and Ingram (2011) found that pre-service teachers were receptive to using ICTs but that their levels of use varied with most utilizing interactive white boards (IWB) but fewer utilizing Web 2.0 technologies. Research spanning two or more decades documents a number of barriers to technology integration in writing and other classroom practices (Hannafin & Savenye, 1993; Selfe, & Hilligoss, 1994; Mumtaz, 2000; Stimmel, Connor, McCaskill, & Durrett, 1981). The focus of this chapter is on two models of teacher professional development used to engage and prepare inservice teachers for using digital technologies and Web 2.0 tools in their writing and literacy instruction. The first model is a more traditional top-down professional development workshop approach provided by university faculty and graduate students in face-to-face and online formats to groups of inservice teachers. 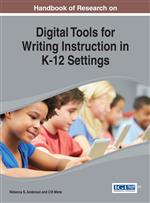 This approach typically included 45 to 90 minute sessions on specific uses of technology in writing, writing instruction, and writing in the content areas. Workshop leaders introduced and modeled the use of wikis, blogs, and Web 2.0 tools such as Stixy and Prezi.